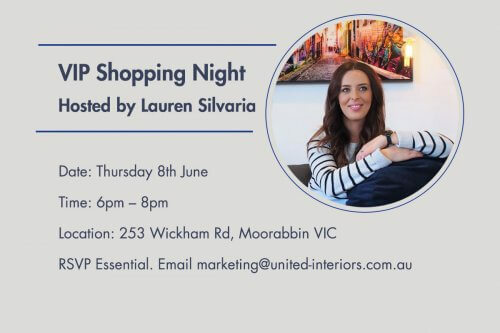 We are very excited to announce our first VIP shopping night hosted by Melbourne interior designer Lauren Silvaria! 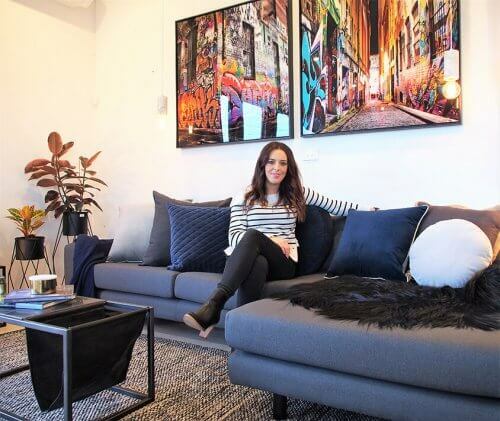 Melbourne interior designer, stylist and renovator Lauren Silvaria has worked in many commercial and residential projects, helping clients discover their personal sense of style and creating spaces they love coming home to. Her hands-on approach and enthusiasm inspires you to visualise your concept and bring it to life. And she’s coming to United Interiors! We are hosting a VIP shopping night with Lauren on Thursday 8th June from 6pm to 8pm at our Melbourne showroom: 253 Wickham Rd, Moorabbin VIC. Join us for drinks and nibbles and watch Lauren walk you through how to style a room using artwork with a live styling demo! And then it’s time for some shopping. It wouldn’t be a VIP night without an exclusive VIP offer! 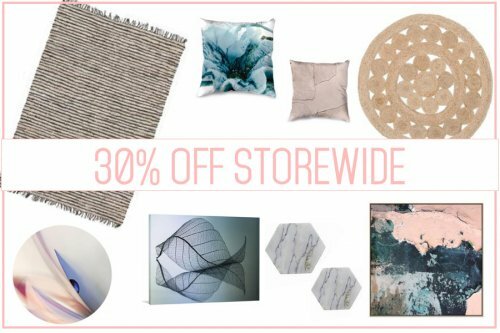 All guests will receive a 30% OFF STOREWIDE special offer to spend in our showroom. Lauren will be on hand to dish out expert styling advice, so you know you’re making all the right choices for your home décor. There is LIMITED CAPACITY available so Lauren can spend as much time answering questions about all things interiors, so reserve your place by RSVP now. Simply email [email protected] with your name and how many guests are attending to secure your VIP place. First in, first served! Get in quick. See you there!